Finding the best holographic sight can be a little overwhelming. There are just so many products out there! That’s why we did plenty of in-depth research and rounded up ten of the best products out there to put together our holographic sight review. Before we get into all the awesome products we found, let’s first take a look at some of the key features you need to know about when looking to buy a holographic sight. Dot Color: These sights come in either red or red and green. There’s no right or wrong answer when it comes to which one is best. It all depends on which color your eye picks up fastest! Adjustable: Adjustable sights allow you to change the pattern of the reticle. You also have more control because you can precisely adjust the windage and elevation. Windage is a left to right change; elevation is up and down. Waterproof: If you’re planning to hunt in all kinds of weather, having a waterproof sight is essential so you get the best performance from your sight. Water resistant isn’t exactly the same as waterproof, but it’s the next best thing. Battery: All of the products in our holographic sight reviews use a CR2032 battery. What exactly is a CR2032 battery? It’s an affordable button lithium ion that generally has a long battery life. They’re easy to find, too. Weight: Our picks range in weight from 3.7 to 17 ounces, which is a pretty wide range. Just make sure the added weight on your shotgun or rifle isn’t going to affect your ability to use it. 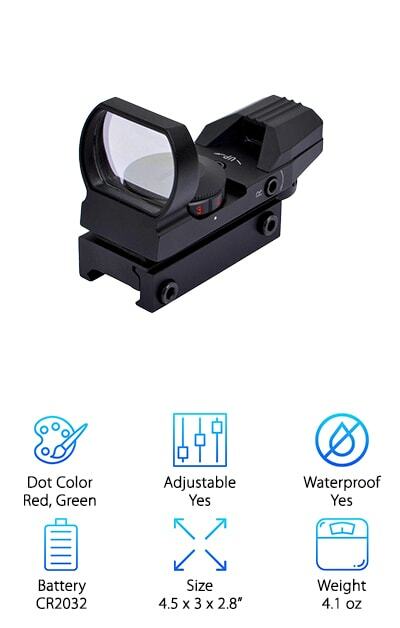 Now that you know a little more about the important features of the best holographic sights, let’s take a look at our reviews. Here’s the deal: the first two items in the list are our top and budget picks. That’s a great place to start if you’re running short on time. If you can stick around, we hope you’ll keep reading to learn more about the rest of the great products that round out our list. All right, let’s get to it! 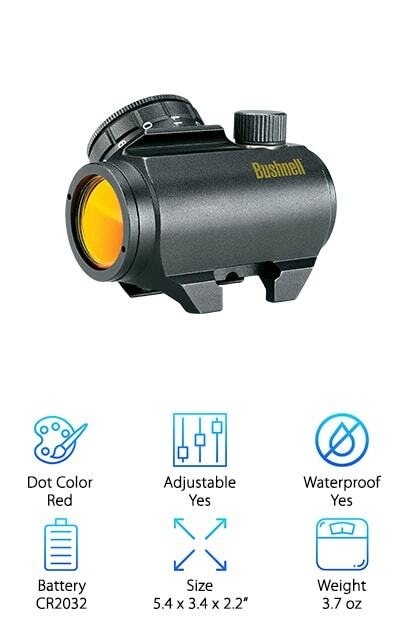 This red dot sight from Bushnell is our top pick. The red dot makes it easy to see the target even in less than ideal conditions. And there’s no mistaking it against a brown tree or even brown prey. It’s been engineered to be bright and unmistakable. You also have some control over the intensity of the dot so you can make sure you get a clear view. We really love that it’s waterproof, fog proof, and shockproof. Basically, it’s just a really solid and reliable piece of equipment that’s almost indestructible. Because you can use the site with both eyes open, you don’t need to worry about centering. Another thing that impressed us? The rigorous testing to make sure the sight is dependable when in the field. 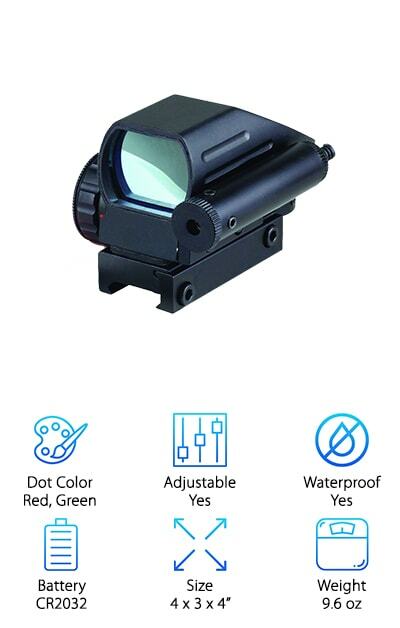 Our best budget holographic sight is this bargain from RioRand. Get this: it’s water-resistant, shockproof, and fog proof. Plus, it’s made of high-quality aircraft grade aluminum. That means it’s both lightweight and durable. The lens is coated to protect it from damage plus it has an anodized matte black finish that protects it from the elements and honestly just looks pretty cool. You get a wide view with this sight and you can fine tune it with windage and elevation adjustments. There are also 4 patterns to choose from and 4 different sizes of dots. We also loved that it has a really long battery life because it was designed for low power consumption. This is the best holographic sight for the money. 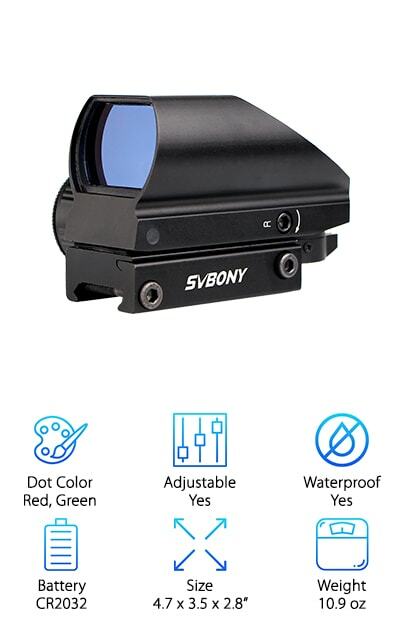 Take a closer look at this sight from SVBONY if you’re looking for the best holographic sight for AR 15. For starters, it has a built-in Picatinny mount base so it’s really easy to mount on an AR15 or any other gun with a standard rail mount of the same size. We really liked the wide field of view, too. It also gives you a lot of ways to adjust the red and green dots. What do we mean but that? Well, you can choose between 5 different brightness levels. That means that, no matter what the conditions, you’ll be able to get things just right. You can adjust it for windage and elevation, too, for impressive accuracy. It even comes with the CR2032 battery you need to get started. 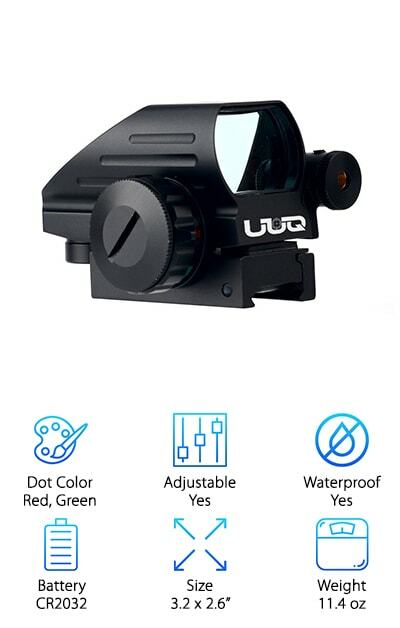 This pick for top holographic sight from UUQ has a built-in mount that makes it a good fit for any standard base. Plus, there’s no need to worry about re-zeroing when remounting. It has both red and green targets and you can adjust the brightness so you’ll always have a bright view. This is a really lightweight option that’s not only completely waterproof but also fog proof and shockproof. The aircraft grade aluminum construction means that it’s really durable, too. Plus, it has low power consumption that makes the battery lasts a really long time. The Picatinny rail base is designed for easy mounting on rifles and shotguns. There’s a lot of adjustments you can make, too, like switching from red to green, picking a reticle pattern, and changing the windage and elevation adjustments. Here’s another great choice for best holographic sight for AR15s. Ozark Armament made the Rhino to be able to stand up to tough conditions. We especially liked the flip-up protective lens cover. This sight is waterproof and made out of aluminum so it’s durable and lightweight. This isn’t a fancy sight, but it definitely has what you need and it’s made really well. Adjusting for windage and elevation is easy. You also have the option of choosing between red and green reticles and you can choose between 5 different brightness levels. The cantilever mounting base makes this one easy to use with AR15 or another comparably sized rifle. And get this. They’re so confident that you’ll love their product, they offer a 1 year no questions asked warranty. What do you have to lose? 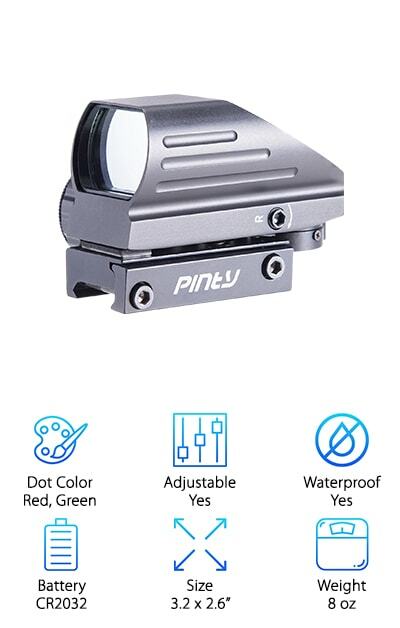 This AR holographic sight from Pinty is made of durable aircraft grade aluminum alloy and is not only really durable but also easy to clean. It’s waterproof, fog proof, and shockproof which means it’s safe to use in any kind of weather. Red and green reticles can be used plus you can choose from 4 patterns so it’s always easy on the eye. You can also make easy windage and elevation adjustments using the tools that come with the sight. And guess what else. The picatinny mount base makes it really easy to remount without any issues on any gun with standard 20mm rails. One of the best things about this site is it’s ready to go right out of the box. It comes everything you need to get out to the shooting range right away. Ledsniper has another one of our picks for best AR holographic sight with this one. For starters, you have the option of red or green reticles. But that’s not all. 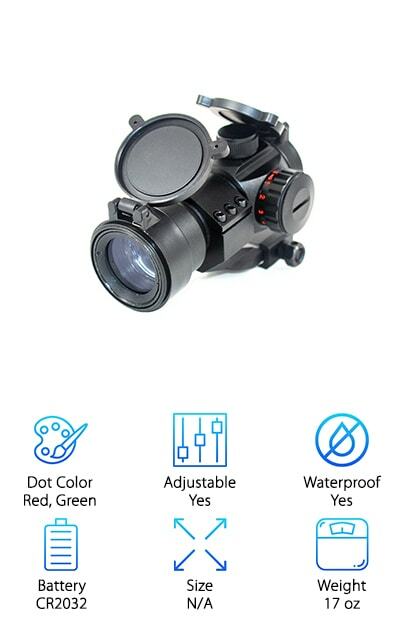 There are also 4 different patterns and 4 different dot sizes to choose from, too, so you can fine tune to the light and weather conditions to always get a perfect shot. Not only is this aluminum sight really durable and lightweight, it’s waterproof and shockproof, too. The integrated rail makes mounting really easy and the battery will last a long time because it was designed for low power consumption. There’s a one-touch remote that instantly turns on the adjustable windage and elevation adjusters. We also really like that it comes with a battery and all the necessary tools. 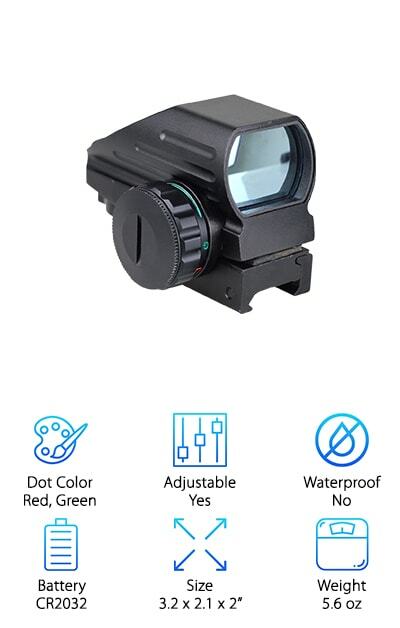 If you’re looking for another budget holographic sight, look no further. 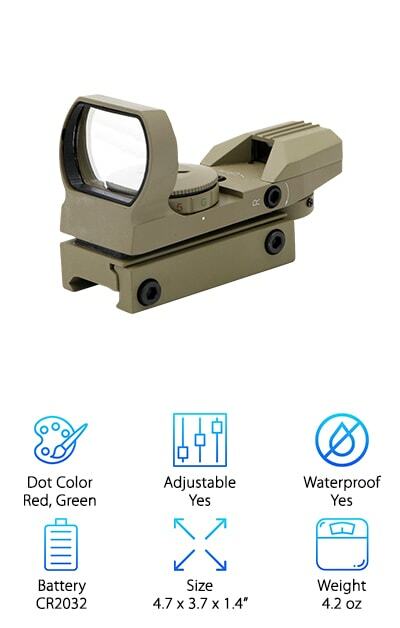 The Feyachi Reflex Sight has both red and green reticles and lets you choose from 4 different styles: dot, circle and dot, crosshair and dot, and crosshair, circle, and dot. Plus, we love the wide field of view because it allows you to keep an eye on what’s going on around you. The rail mounting system is really sturdy. It won’t come loose and will last a long time, making this a great value. That’s not all, it’s also waterproof and shockproof so you’ll feel comfortable using it all kinds of weather. It’s also extremely lightweight plus it comes with a lot of nice accessories. Specifically, you get a lens cap cover, cleaning cloth, battery, and wrenches. 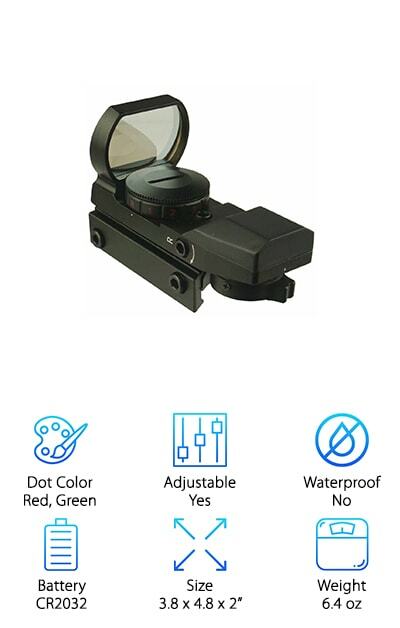 For a red and green dot sight, look no further than this Ohuhu. In addition to the option of red or green, you also get 4 different patterns and 4 different sized dots to choose from. We love that it’s ultra- lightweight, waterproof, and shockproof. You can feel comfortable using it outside in any kind of weather conditions. Another great thing about this sight is the wide field of vision. That means you can keep an eye on everything else going on around you while still focusing on your target. The built-in mount is standard and fits onto most bases without needing any re-zeroing. It comes with an Allen head wrench for any windage and elevation adjustments you need to make. That’s not all. It also comes with a 12-month warranty. The last holographic sight with laser on our list is the GERO Tactical Sight that gives you really accurate sighting. Get this: The manufacturer tested it by smashing it with paintballs traveling around 300 feet per second and didn’t even get a scratch. What does that mean? This is one heavy duty sight that’s built to last. Plus, it’s water-resistant and shockproof so you can use it in a variety of weather conditions. There’s more. There are 4 different reticle patterns to choose from so you can make sure you see the target as clearly as possible. Oh, and the built-in Picatinny base makes it really easy to mount. Still not sure? Well, here’s the kicker. This sight comes with an unconditional 1-year warranty and excellent customer service.